When you find yourself in Steamboat Springs for a weekend mountain staycation with friends; you naturally scout out the area’s breweries. Maybe that’s just me – but it’s most definitely how this past weekend played out! After waiting out the inclement weather and making the journey I found myself craving a cold brew. So scattered throughout visits to Old Town Hot Springs, hilarious games of Cards Against Humanity, and the occasional bear sighting – we made our way to a few of the local watering holes. brews they also feature a food menu as well! Score! We chose to split both the Rancher and Calabrese pizzas, and multiple Campfire S’Mores. Allow me to recommend paring the Mountain Macaroon with the Campfire S’More. You won’t be disappointed! At our server’s suggestion several of us ordered this combo and it was spot on! Speaking of our server – she was terrific! She made some wonderful recommendations, helped me out with some merch, and even gave me some fun facts about the brewery. Did you know the pizza oven was actually shipped in from Italy? Now you do! 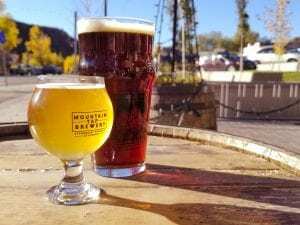 Mountain Tap Brewery was a great first stop on our brewventure through Steamboat Springs. what they had to offer. All the brews were delicious! While they didn’t have any funky or sour brews on tap, typically my favorite types; they did have their gold medal winning (Great American Beer Festival 2018) Sunshine Express Session IPA. While IPA’s are one of my least favorite styles, I must admit, they are growing on me and both this and Amputator were solid in my book. I also sipped on their Pilsner and Hefeweizen. The Pilsner was wonderfully light and crisp while it definitely lingers. 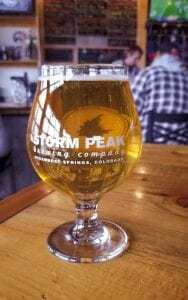 Throughout my visit I was engaged in conversation with the friendliest of beertenders about Steamboat Springs, winter, beers, and of course the brewery. During our conversation I learned about some impressive future plans for the brewery. I’m eager to watch this little gem grow! Storm Peak Brewing Company. 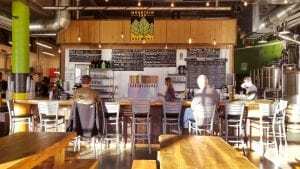 This dog-friendly taproom is located a mere half mile from Butcherknife Brewing Company on Elk River Road. 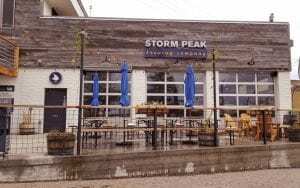 Storm Peak Brewing Company is a moderately sized taproom that really aims to build community. The beertenders definitely know the regulars, it’s dog-friendly, features a variety of boardgames, and has ample community style seating to accommodate any type and size for group. 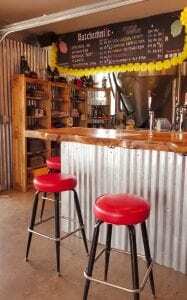 While the taproom is moderately sized they do a great job keeping it cozy feeling. With classics such as IPA’s, pale ales, ambers, to funky sours, and experimental brews – their tap list caters to any type of beer lover! I opted for the Hoochie Mama, a sour blonde with guava, which received chuckles from a couple of regulars around me as I ordered at the bar. It was wonderfully tropical with the perfect amount of sour notes. 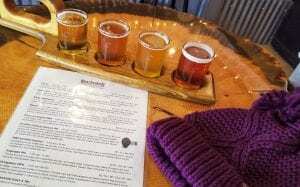 A big perk for this brewery is that it is on the route for the town shuttle service. So, if you’re in town visiting and prefer not to drive – you’re covered! 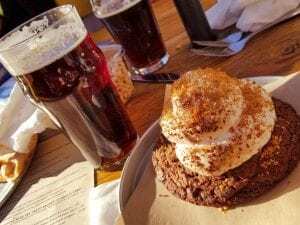 So next time you’re needing a little mountain brewventure, don’t hesitate to make your way up to Steamboat Springs and check out some of these killer mountain brewery taprooms! You won’t be disappointed! 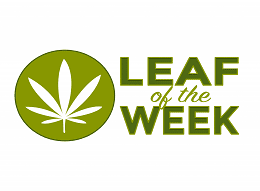 Carly is a Northern California native turned Coloradan. From night-life to the great outdoors, her twelve years in Colorful Colorado have been a whirlwind; soaking up every bit of its western glory and Yelping about her every adventure. Having held down her Elite status since 2013, Carly is known in the community for detailed and unique business reviews blended with gorgeous photography, her vast local brewery knowledge, and always being in-the-know about local happenings. When not in class at Community College of Aurora finishing her associate degree in business, Carly can be found roaming the Colorado craft beer scene after a morning hike with her Boston terrier, volunteering or indulging as a guest at local festivals, or devouring the latest street tacos. After her graduation in the spring of 2019, Carly intends to transfer to Metropolitan State University to pursue her bachelor's degree in marketing and ultimately her career and passion for beer at one of Colorado's many fantastic breweries.